The two dominating trends among EU leaders are to cut losses of players in virtual economy at the expense of taxpayers and to guide EU towards strict federation at the expense of democracy. The financial crisis has been in headlines already few years. Despite continuous emergency meetings between EU and especially Eurozone countries no light can be seen for better future. Despite more and more ”effective” measures the markets are not satisfied more than few hours or days. In my opinion it is time finally admit that selected strategy to save euro has been disaster – not maybe to banks and speculators but to ordinary citizens at least. It is time to make alternative visions not only for Euro but for whole EU too, time to whistle game out, collect losses and start new game in Day after Euro/EU context. Today strategic decisions are hard to agree due 27 different circumstances in 27 member-states (and more to come with enlargement). Also “European Monetary Union” is dead as economies inside Eurozone differ too much. It would seem nowadays that the Eurozone leaders have decided to place the region under Martial law. Old principles about democracy, subsidiarity etc are forgotten. From my viewpoint intervene again and again into something that is not going to work in the long run is the wrong medicine. The two dominating trends among EU leaders are to cut losses of players in virtual economy at the expense of taxpayers and to guide EU towards strict federation at the expense of democracy. Change to this is needed for saving 99 % of people instead saving profits of the rest one per cent. Euro-zone, European Central Bank and IMF seem to have only one ultra-liberalist strategy to solve problem – cutting salary, public services and social benefits from ordinary citizens and saving some financial institutions, funds and speculators from bigger losses. But the problem will not be solved with this strategy and the reason is that these financial institutions and speculators have created a virtual financial world ( derivative markets, futures, hedge-funds …) which value is about ten times more than the real economy. I am not an economist but anyway how could this equation be solved with selected strategy. Grexit now would be best for all. The new currency should be introduced at a one-for-one rate with the euro. But it will soon depreciate by something like 30-50% giving a boost to Greece’s international competitiveness. The government should renominate its debt in the new national currency and make clear its intention to renegotiate the terms of this debt. Different analysts estimate that the overall debt load continues to grow faster than the economy, then large-scale debt restructuring becomes inevitable. Greece has been in a state of slow motion economic collapse on the scale of past economic collapses such as that of Argentina but so far without the ability to default, devalue and inflate. It is to be noted that the case of Argentina shows one successful example how to copy in a similar situation. Many economists, mostly from outside Europe, condemned the design of the Euro currency system from the beginning and have since been advocating that Greece (and the other debtor nations) unilaterally leave the Eurozone, which would allow Greece to withdraw simultaneously from the Eurozone and reintroduce its national currency the drachma at a debased rate. However the political will, or fear, has kept Eurozone leaders in their expired visions – current political leaders might be affraid to apply Modern Monetary Theory or post-Keynesian views. The European bailouts are largely about shifting exposure from banks and others, who otherwise are lined up for losses on the sovereign debt they recklessly bought, onto European taxpayers. However I believe that many of them will be either be replaced or finally they have courage to take new appraoach. 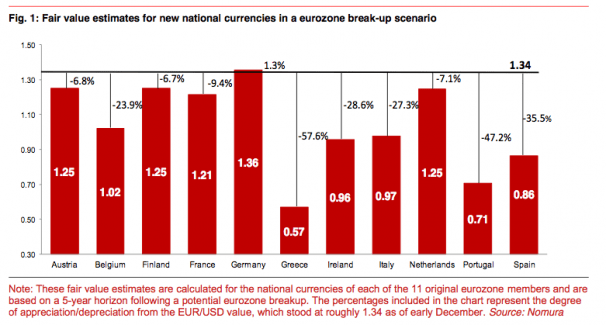 There are clear advantages to ridding Europe of the euro. Countries now suffering with debt could return to their national currencies, devalue, and regain competitiveness more easily. They wouldn’t have the same financial safety-net – at Eurozone level – but their freedom would also allow them to chart their own course. The poor outsiders could negotiate debt restructurings and a more fair division of losses would result and same time the rich outsiders could probably put their economies on a stronger growth path by using their money for supporting investments in real economy of their country instead supporting saving efforts of speculator money in virtual economy. Now Eurozone as well EU as construction is on the verge of tumbling down. EU bureaucracy is implementing their only truth by trying to guide EU towards federation. Earlier agreements in Maastricht, Barcelona and Lisbon were only soft exercises. Now financial crisis has enabled stronger methods. In March 2011 a new reform of the Stability and Growth Pact was initiated, which provides for automatic penalties and obligations for states in case of breaches of either the deficit or the debt rules. By the end of the year, Germany, France and some other smaller EU countries went a step further and vowed to create a fiscal union across the Eurozone with strict and enforceable fiscal rules and automatic penalties embedded in the EU treaties. (More e.g. Wikipedia). With the “golden rule” the Stability and Growth Pact, the political choices of national parliaments are limited. Besides killing the democracy the Pact will kill growth too so putting people in misery and dismay. The Pact is new tool for the plundering of the public services and the destruction of social rights in all EU countries. The best scenario from my point of view could be some kind of EU Lite version. A bit of similar ”privileged partnership” agreement than planed with Turkey. EU Lite should be build simply to EU’s early basics as economical cooperation area including a customs union, the EU tariff band, competition etc linked to idea of the Common Market. EU Lite could also apply a structure of Confederation. Also some kind of fiscal confederation can be shaped. EU Lite could be described also as a political union and there could be some forum for national parliamentarians and party leaders. Federalist intentions, the EU puppet parliament and the most of EU bureaucracy should from my point of view put in litter basket together with high-flown statements and other nonsense. The investors face normally e.g Interest rate risk, credit (i.e default) risk, volatility risk, structure risk, counter-party credit risk, prepayment risk, general market risk, liquidity risk, extension risk, transparency risk, political risk, and currency risk and now also with Euro a dissolution risk. As said this is normal and because of those risks also the profits are huge. But the basic principle in is that with investments and not to speak even speculations there is two sides – wins and losses. In my opinion the loss should no more be paid by taxpayers. Why to join? Due the needs of people or due the needs of Brussels or elite? When related to time-line? Association process is long and circumstances are changing, after EU/Eurozone crisis who know what kind of EU if any still exists, same time other regional and global power-centers are rising and options should be open. Where? Now it is open question if country is joining in future to strict federation with martial law, to some sub-category of loose federation, confederation, open discussion forum or free trade zone only. With today’s strategy there is a risk that the combination of economic insecurity and political paralysis has been recipe for an increase in extremism and xenophobia. It is slow motion death spiral of economic collapse. That is the base to my view that people should be the first priority and not virtual economy, fiscal system, euro or even EU. As interests even inside Eurozone differ these new principles in my opinion have best change if implemented at national level. So e.g each country could nationalize their bankrupting banks, each country could start implement Toby’n (or transaction) tax by national decisions. And when different countries find common interests so new formations, forums and cooperation can be established. You are currently browsing the Conflicts by Ari Rusila blog archives for July, 2012.